Since sport psychology exploded onto the world scene with the 1976 Montreal Olympics there have been literally thousands of books and articles published on how to “do mental training”. My particular approach was adopted by the Coaching Association of Canada and integrated into their 5-Level coaching system – I wrote the sport psychology content for Levels 1,2, and 3 (French version). Here is the original article describing my approach: Bacon (1989). Periodization of Mental Training. Introductory meeting (60 min.) To help guide athletes to enquire about and learn lessons from their own best and worst sport performances. Athletes complete an individual form and we take up some of the answers in a group setting. I introduce Jim Loehr’s Ideal Performance State (IPS) model – still the simplest out there in 2016 – you can download a copy here: ipsloehrsports. Goal-Setting and Introduction to Mental Skills meeting (60 min.) There are a multitude of goal-setting forms available, but Terry Orlick’s form is still the best with key questions on dream, realistic and specific mental goals. My mental skills approach involves having the athletes do 1-2 basic 2-3 minute exercises from each of the five categories of skills: relaxation, positive self-talk, activation, visualization and concentration – followed by a 2-3 min. I facilitate a short discussion on how these skills can be used in an actual competition. Optional additional self-assessment questionnaires (very short or more comprehensive) can be completed by the athletes to help them zone in on specific areas they need to work on. Orlick also has a short one-page “self-directed interview” the athletes can complete before this meeting. Here is a link to a YouTube video where I demonstrate the different exercises. Focus Plan meeting (60 min.). To help athletes to write a one-page plan on a) how to prepare optimally, both physically and mentally for a competition; b) how to focus their attention at key moments in a competition (e.g., start, in between points, near the end of a game, near the end of a match, etc.). Here is one of the forms we have used in the past: Squash Focus Plan Form and a post with more details on how to develop a Focus Plan. Distraction Control (Refocus) Plan and Competition Evaluation meeting (60 min.). To help athletes develop a written list of situations that cause them to play poorly or lose their focus, and though group discussion lead them to find possible solutions to get back on track. The final step is to introduce an evaluation process – which includes a written form – that they can complete after every competition to speed up their “experience” and development of mental toughness. Here is one of the forms we have used in the past: squash-match-evaluation-form. The meeting format I use closely follows the meeting format recommended by Terry Orlick in his book Psyched for Sport (out of print but available used on Amazon.com) – all Canadian National Team and Olympic coaches have been trained in this approach. Canada is generally recognized as having one of the top coaching training programs in the world. in fact you cannot coach on a Canadian National team if you have not obtained your Level 4 Coaching Certification (I got mine way back in 1988 in the first cohort of Squash Canada Level 4 coaches). Following the above four-meeting approach above, a coach will meet the needs of about 80% of their athletes (80/20 rule:). There will always be athletes that need more assistance in developing mental toughness and solving “mental problems”. If you need help preparing your mental training program, or would want to engage me to run the meetings for your team drop me a line at squashscience@gmail.com – rates start at $50 U.S. per hour. Here is a link to my Facebook Page. Tim Bacon, M.A., CSCS is the world’s leading expert on racquet sport science and coaching development having taught all areas of sport science as both a Lecturer at Smith College and as a Coach Developer for the Coaching Association of Canada while actively coaching (Certified Squash, Tennis & Badminton Coach) and sport psychology consulting (25+ World Champions). He currently runs his consulting practice out of Northampton, MA and maintains his active coaching as the Assistant Squash Coach at Wesleyan University during the CSA squash season (Nov. 1 – Mar. 1). Many squash spectators, players and even coaches misunderstand squash “quickness and speed”, attributing a “fast” player’s ability to physical factors rather than their ability to anticipate what the opponent is likely to do – or not do (partial anticipation). One of the ways to “slow down” a fast player is to use deception to hold your opponent stationary for a longer time or even misdirect them. I have blogged on both (Deception link and Anticipation link) of these topics before but now want to combine them since it is the same, identical motor learning theory behind both notions. 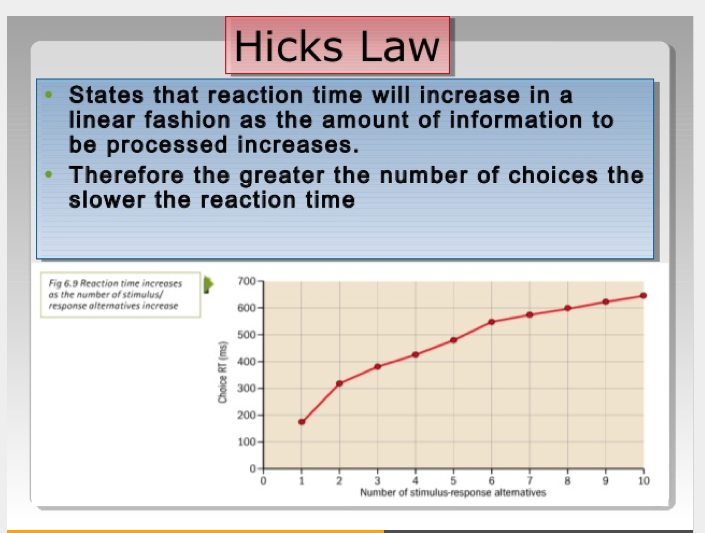 The theoretical idea (e.g., Hick’s Law) behind both anticipation and deception is very simple – the greater the number of options or choices – the slower the reaction time – as illustrated in the graph below. When you have glued a straight length to the side wall your opponent has only one choice – to hit straight – so you can cheat over to cut off their shot. When you have hit a loose, slow easy ball into the middle of the court, your opponent has so many choices (drive straight or cross, drop straight or cross) that you cannot anticipate and you have to stay put until they actually hit the shot. As I have blogged before, the best way to develop deceptive players who anticipate well is to have young children (8-12?) be introduced to squash in an environment where deception is valued and they are exposed to a wide variety of practice partners and opponents – then these perceptual-motor skills develop “automatically”. If you are a junior in America this is probably not going to happen since your British squash coach is having you hit endless straight lengths down the wall and working on your fitness through hours of mindless boast and drive. I feel free to joke and make this outlandishly exaggerated comment as I am in fact British:) But although I am joking about “only hit straight lengths a la Jonah Barrington, there is far too much closed drilling going on in our junior programs – and not enough tactical teaching. 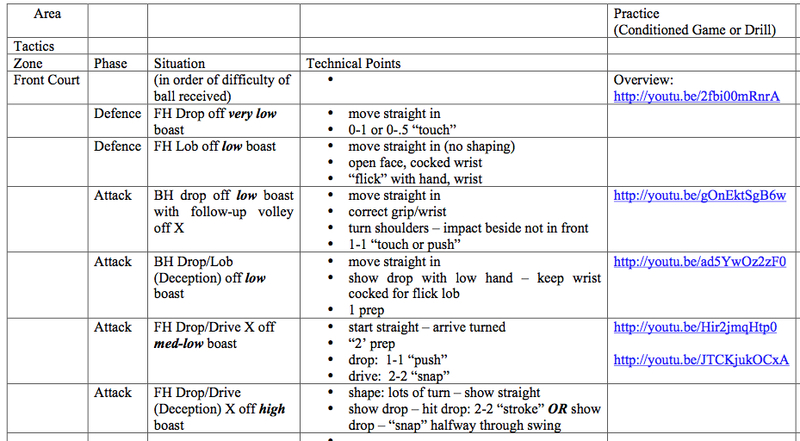 Here is an example of “tactical teaching” using the Games Approach (ASEP, 2012). Since in many places great anticipation and deception will not be developed automatically, a systematic approach is needed. What do we mean by systematic? Make a list of all situations to be trained in priority order, and make sure to teach anticipation cues and deception options when you introduce and train the situation. Note that “priority order” could mean start with the a) most common situations; b) “easiest” situations (to help athlete gain confidence); c) most difficult situations (since these take longer to learn); d) most important (the situations that cause you to lose the most points in your current match play). Theoretically, these lists should be tailored to the developmental level of your player, and integrated into annual, four-year and “lifetime” (e.g., LTAD plans). Here is an example of a list of prioritized situations. Do not leave the development of anticipation and deception to chance – train these qualities systematically. Train situations not strokes – include the teaching of anticipation and deception every time you train a particular situation. Plan your teaching of anticipation and deception by including these in your written annual, four-year, and LTAD plans. Squash Coaches Can Produce Great Strength Programs with FitnessBuilder! 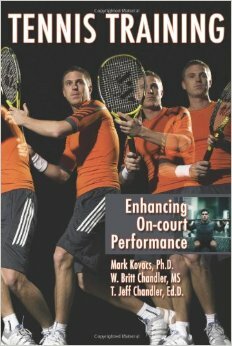 It is the start of the new 2015-16 for most U.S. College and High School squash coaches, and to help them plan for the upcoming year, I have just published two blog articles on squash periodization: one on the Transition Phase and the other on Periodization of Technique and Tactics in the General Preparation Phase (GPP). My next periodization article in the series will be on the planning of strength training in the GPP. 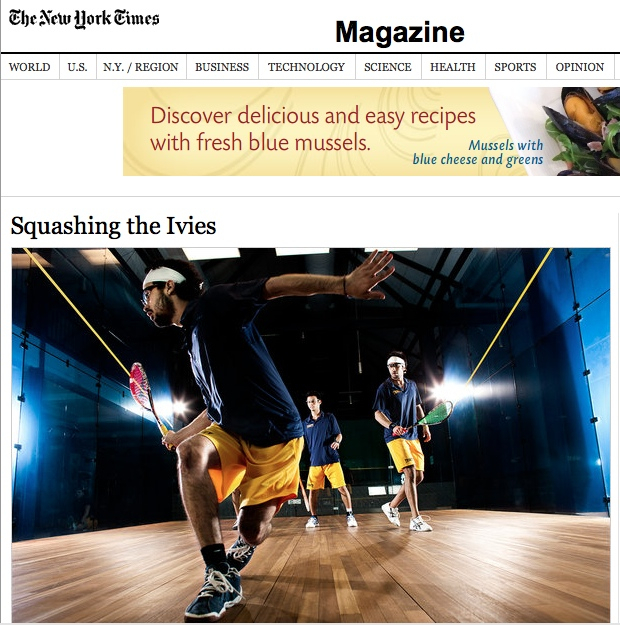 Now here is the catch – are you qualified to design a periodized squash-specific strength program – or are you just going to “wing it” or copy somebody else’s program – or worse – use the program that got you a hip replacement? If you do not have access to a CSCS with extensive squash experience, a smart alternative is to subscribe to the Exos (formerly Core Performance website) and either a) use their squash or tennis programs; or b) follow their template and select from amongst their bank of exercises when you use fitness builder. Eighty per cent of the exercises I use with my team are the same or highly similar to Exos exercises (I like to think my programs are a little better than theirs due to my 40 years of experience designing squash-specific strength programs:). 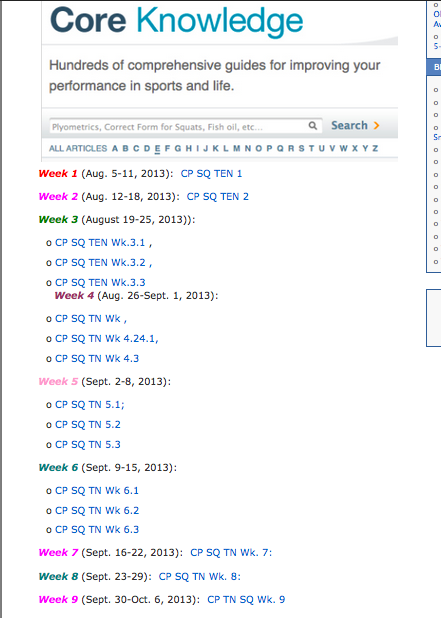 This is what I did four years ago – every week in the fall (I started my Smith Squash Team on September 15th) I would upload the appropriate EXOS training program for both the Smith Tennis and Squash Teams to follow. As a minimum, I would design one program per phase of the annual plan. If you have an assistant or enjoy this type of coaching you could change the plan up every two weeks, but the law of diminishing returns applies and you would probably be better off spending your time recruiting. Last couple of words on this topic. If you are a squash coach working with not yet fully mature juniors, make sure you follow LTAD guidelines for squash or tennis. If you need help in this area please give me a call – my rates are reasonable to develop custom branded programs for you and your team. If you are a U.S. College or High School squash coach, your team’s season probably ended about the end of February. If you use a periodization scientific approach (e.g., Bompa, 2009) to planning your team’s training, most of your athlete’s will have either completed or be near completing their 4-6 week transition period – so it is time for you to start guiding them for the start of their 2015-2016 season. This means you will have already completed the chart above with the year’s major training tasks and calendar of competitions – unfortunately there are no published guides for squash – only what you can find here on my blog. You can use the “search” function and enter the keyword “periodization”. The biggest mistake coaches and parents make is to invite a world champion or their coach as a guest speaker – the needs of a mature, already developed professional are very different from those of junior or even college players. The planning of training has to be appropriate to the developmental level of the athlete – you can refer to articles on LTADs for some guidance on this. – If squash courts or good squash coaching is unavailable, do not do any technical/tactical development – save that for the start of the Specific Preparation phase which normally starts in September when players return to their school. Most college players will not have access to their coaches until mid-October or November 1 – a ridiculous situation that accounts for the general low improvement levels of American college squash players compared to the rest of the world. – Make use of summer squash camps to improve technique and learn more about good tactics. It is important to emphasize improvement and not performance and match play at these camps. – If you do have access to a good squash coach, the General Preparation phase is the time to work on difficult and important technical corrections and improvements. Ideally a player’s technical goals should be set with the use of an objective video analysis – there are now plenty of apps to help with that. These are best achieved in a low pressure setting, that is when there are not a lot of competitive squash matches. Note that although technical improvement should be favored in this phase, a Tactics First approach dictates that you should always make sure the player is clear on the tactical context in which the technical skills will be used – don’t just do mindless, repetitive drills. – If you are in a city where there is a summer squash league, making the technical changes during match play should be emphasized over winning – otherwise most will be unable to make the required technical changes – they will just go back to their old, incorrect ways in order to try and win the match. – Although techniques is the priority, the Games Approach pedagogy (starting a training session with a conditioned game where the targeted technique will be used frequently) can still be used. – If you are coaching squash layers with solid technique, the the General Preparation periodization can be somewhat different. Preferably using the results of an objective video analysis, the tactical situations a player needs to develop should be organized and put into a priority order, and worked on systematically during this phase (and the following Specific Preparation phase) using a Tactics First, Decision Training or Games Approach – versus the traditional “let’s work on your backhand” approach. Here is an example of how to structure such a technical-tactical training session using the topic of “drop or lob in the front court”. This is also a great time to develop complex skills such as deception. In the video below I guide Karim Darwish through a session of teaching deception at a junior summer camp. So you can see that the planning of technical and tactical improvement in the General Preparation is partly an art (based on coaching or consulting experience) as well as a science, the major factors being the availability of courts, opponents, and good coaching and the developmental level of the athlete. I would be happy to help any coach, parent of athlete plan out this important phase of the annual plan. 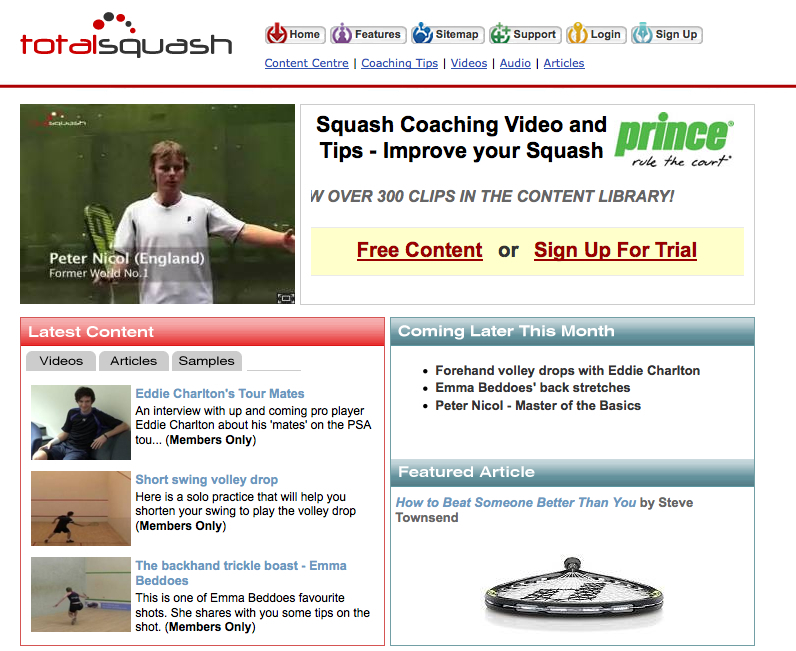 Well Designed Squash Instruction Videos – Free! 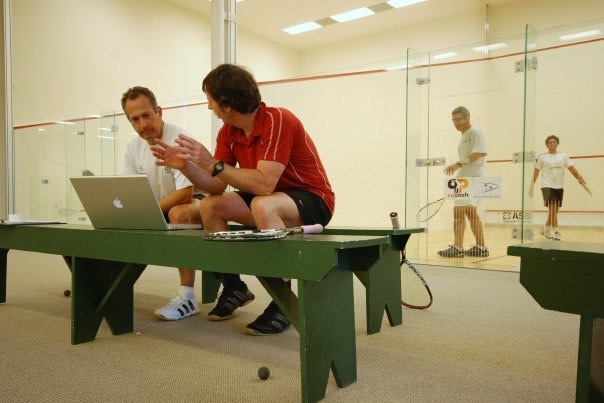 I was perusing some squash sites and came across one that I am going to add to my links section of our Science of Coaching Squash Blog: TotalSquash. I try and list only “high quality” links on this blog. There is a paid section (which I did not investigate) but there is also an “open” section which is free: Total Squash. They have an interesting take on a number of topics (“Return of Serve Chess”, “Traffic Light “T””, etc. and so I think the site is worth a visit! If you read my previous post – you will have discerned that I do not believe in recruiting junior squash players to play for a college team. I just want to explain my rationale a bit further – and give you a great lead if you are hell bent on establishing a great team through recruiting. Racquetball was a bit different – we had quite a few world champions during the time I worked with the team – they all went to University in Canada: Ross Harvey (and played #1 for the University of Guelph Squash Team while attending Vet School – at the OUAA squash champs I played racquetball with him as he had the world championships a week later); Heather Stupp went to McGill; Sherman Greenfield (who attributed his mid-career success as an unheard of “defensive style” to his squash playing – he was a solid “A” player. 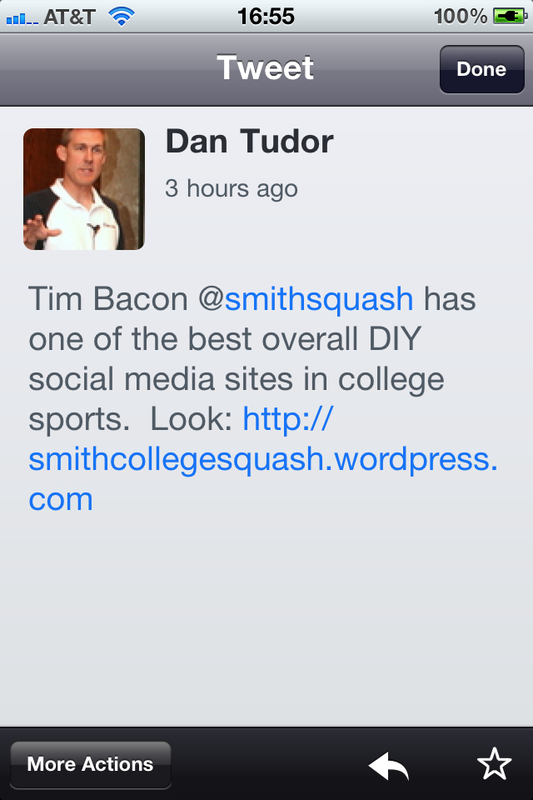 So I do not think I can be blamed for thinking “what is all this fuss about college squash”. Although the level of play has improved, due in part to both the growth in U.S. Junior Squash and an influx of foreign players to the “recruited” ranks, very few college players have gone on to play in the upper echelons of the pro tour – Demer Holleran had a good career on the women’s side and Julian Illingworth is still giving it a go on the men’s. Note on the use of the term “loser”: I support any person at any level of athletic ability giving their all to improve in their sport of choice – this includes all levels of university and college competition. What bothers me is the often “cuthroat” decisions made by self-important coaches and sport administrators concerning sportsmanship issues (including recruiting violations and athlete sport injuries ). I really do believe that high school squash players should chose a college based on its academic suitability, and that squash coaches should work with the players they are presented with. 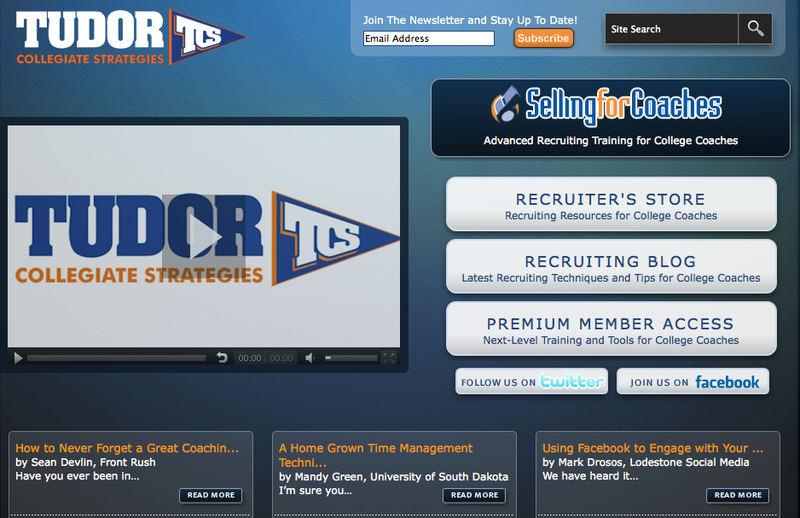 However, if you want to recruit, I highly recommend the approach of Dan Tudor, and his company Tudor Collegiate Strategies. Be very clear on what you are “selling” – and consistently sell those “themes”. I addition to the workshop, if you follow Dan on Twitter and subscribe to his website and e-mails, you get regular information for free! Two years after Dan’s workshop, I have had our best recruiting year ever – more than a dozen applications (our best previous year was 3), two ED recruits admitted, one regular decision admitted (we are still waiting to here if she accepts our offer), and one more top prospect still a possibility. I am attributing all of this success to Dan’s approach since I have made no cold calls, written zero letters, and not attended a single junior tournament. 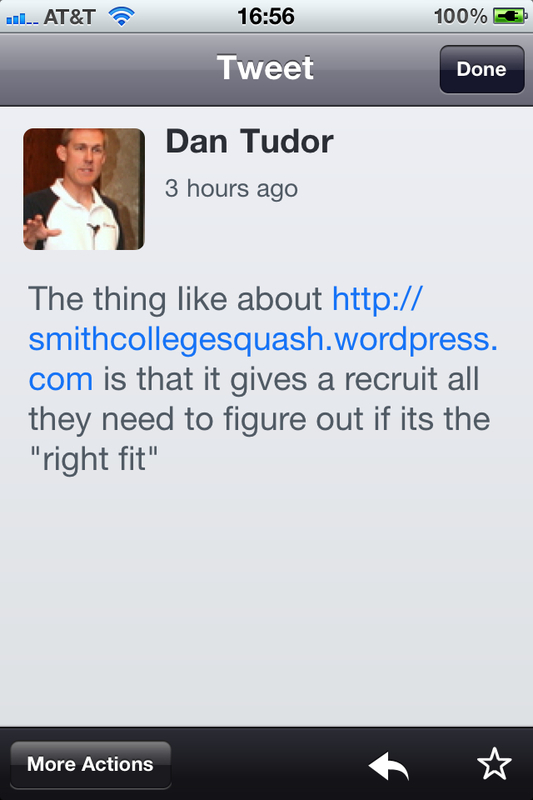 What I have done is simply make regular posts about our team’s activities and approach to squash – simply as Dan puts it (below), “trying to help the student determine if Smith College is the “right fit”. 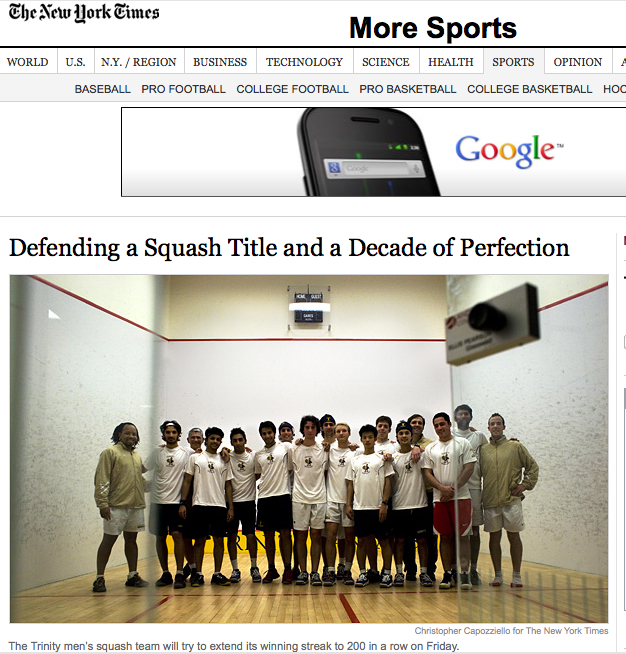 If you Google “college squash” our Smith College Squash team site has come up as #2 – right behind the College Squash Association official website (the old site SquashTalk.com still sticks around at #2 occasionally???). Recruiting is NOT Squash Coaching! I have tried in vain to convince my Athletic Director – and my colleagues in the Department of Exercise & Sport Studies at Smith College that recruiting is not coaching – I am having another crack at it with this post! Our department chair – Jim Johnson comments: “I have never said that recruiting is coaching. I do believe that one’s won/loss record is related to their recruiting ability but not necessarily success as defined by many.”. Before I support my proposition, I would like to argue that Talent Identification is part of coaching! 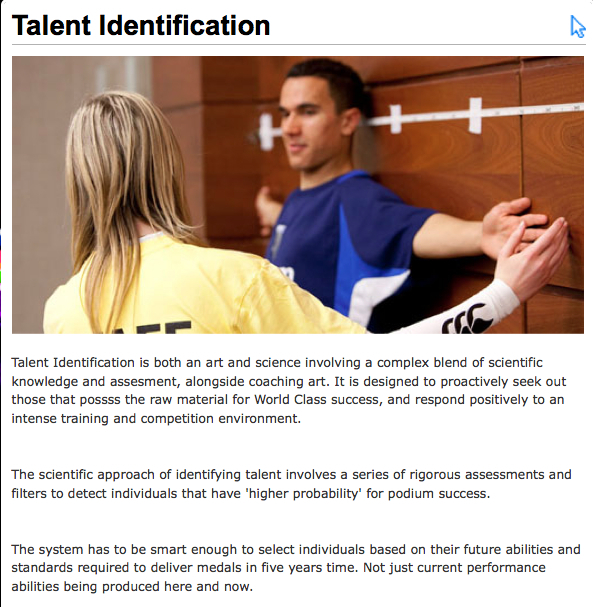 As you can see from this excerpt from the English Institute of Sport talent identification is a “complex blend of scientific knowledge and assessment” – requiring excellent knowledge in all areas of sport science and coaching. When paired with a sound Long Term Athlete Development Plan, and a solid, integrated national health and welfare policy (that includes the role of sport at both the elite and recreational/wellness level – here is Ireland’s – a great example) Talent ID is a worthy pursuit. The U.S. lacks a coherent strategy that integrates sport and wellness, due mostly to the pervasiveness of the “pro sport” or Division I major sports” philosophy or model – which accounts for their poor relative performance at the international level. 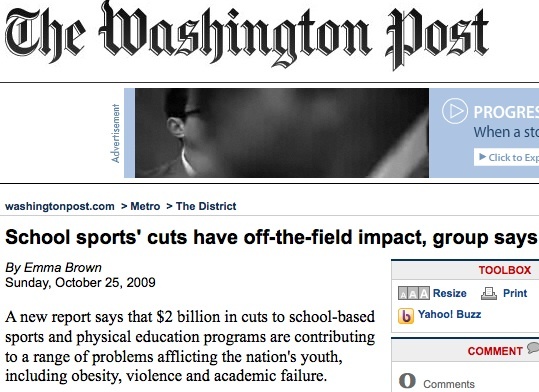 The effect of this lack of a comprehensive sport policy can be extended to the college level, where teams are being cut due to the inability of Athletic Directors to associate the benefits of athletics participation to the overall College mission, which includes student well-being (the same could be said of High School Physical Education programs). U.S. College recruiting on the other hand is not skillful (I suppose salesmanship is a skill? :) and requires almost no sport science knowledge. For example in college squash, U.S. Squash sends a list of all the juniors who compete in tournaments along with their contact information to each college coach – all a coach has to do is be able to write an e-mail. It has been my observation, based mostly on 20 years of summer camps at Princeton university, that for most junior squash players in the U.S. (and more recently foreign players as well) college squash is simply a vehicle to be able to attend the best academic institution possible. Simply put, everything else being equal, the best junior squash players will attend the best available school (I got a .43 correlation coefficient when I correlated the college squash rankings with the U.S. College news college rankings.). The top academic schools – and some of the ones not so near the top – seem very happy to lower their usually high admissions standards to admit a top player – adding imbalance to an already UN-level playing field (a level playing field being a key component of sportsmanship/fairplay). What strikes me most is the disconnect between an academic institution’s public statements concerning the role of varsity sports in developing leadership and human potential and the actual communications that take place between Athletic Directors and coaches “you had better win or else” (a Division III comment) – and the current “frenzy” to recruit. The discussions around the success of the Trinity Men’s Squash Program provide a vehicle to examine many of the issues around coaching and recruiting. On one hand the Trinity approach to recruiting has violated the “level playing field” principle for its NESCAC peers, while on the other has in fact redressed the “un-level playing field” that had advantaged the Ivy’s for so many years. This very American glorification of being #1, and a willingness to put aside related potential ethical issues (e.g., look at the public’s acceptance of MacEnroe’s tennis behavior – or Bobby Knight’s), concerns me. It might appear to be reminiscent of past U.S. Foreign policy (e.g., “the accusation that the United States has striven to single-handedly dominate world affairs.”). Having coached squash at a Division I college level (University of Western Ontario at a time when they usually finished top three in U.S. College Squash), as well as coaching (and consulting) at the International Level (e.g., Canadian Jr. National Squash Team with Jonathon Power, Graham Ryding; Olympic Gold in Tennis Doubles, etc. ), I am unimpressed with rankings of any sort. 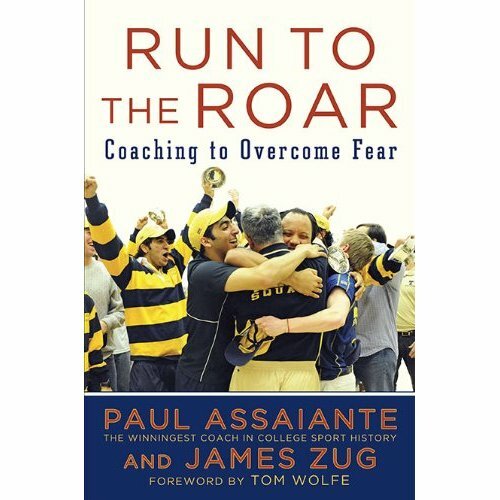 My respect for Paul Assiante, the Trinity coach, is based on my squash discussions with him, and more recently the coaching values that come across in his recently published book – not his win-loss record. The idea that recruiting success (and the associated win-loss record) equates with coaching ability is a strange one for me. “Recruiting” does not play a role in any coaching education program that I know of – outside of the U.S – talent identification definitely does. Considering that the average age of top performance in squash is 27-28, I would suggest that Athletic Director’s (and in some cases college Presidents) direct their coach-employees to take the estimated 30% of their work week that they devote to recruiting, and better use that time to mentor their charges. Ironically, the Admissions Department here at Smith has, for the first time in my 16 years at the college, admitted several (2 ED, and possibly two more top junior players) squash recruits – so we are looking at moving up at least 10 spots in the rankings (we won’t get to the #12 spot (21-4 win-loss record) we achieved in 1998 and 1999 with a team with only one player who had played at high school:). As I explained to my team at our season-ending meeting – the new players will make absolutely no difference to our win-loss record, as I will simply schedule more difficult teams in an attempt to play against opponents of similar ability – thereby maximizing their improvement.